Crystal grids for strengthening family bonds are an important tool as a relationship between many couples take a toll because of a fast-paced lifestyle. Since everyone is involved in their own activities and jobs there is a certain lack of communication between family members who do not spend much time with each other. Sometimes the spouses get involved in extramarital relationships at workplace since they spend much more time there as compared to their home. Most newly married couples have issues of compatibility and adjustment issues in the first few years. These can be set right only by a commitment and looking each other’s faults. 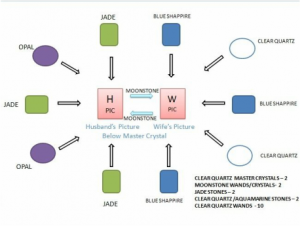 The picture given on top is a sample of crystal grids for strengthening family bonds that can be used by anyone for improvement of relationships after getting it energized from array key master energizing it yourself in case you are a Ricky practitioner who has been taught the second level and above. Take a paper and write your affirmation as for creating a fulfilling relationship and strong family bonds and bringing (your name), (hubby’s name) & (Others name e.g. child’s name) together. On this folded sheet place Pictures of you on right hubby.